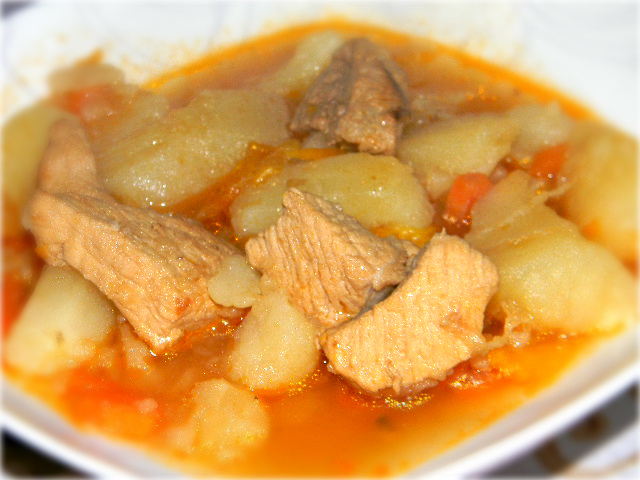 The sauce is cooked in thick soup with lots of potatoes. Sauce pork turns thick, rich and very hearty. Instead of pork can I use beef or chicken. The pork should be washed in water and cut into small pieces. In a saucepan put the sliced pieces of meat. From top to pour water, about 4 liters. Liquid should be half covered. The pot should be put on a small fire. As the broth boils, remove the foam. Meanwhile, it is necessary to slice the potatoes. The potato slices should be large, so in the process of cooking they are not dissolved and do not spoil the sauce. After adding the potatoes, broth should cover it for a couple of inches. Then the dish and salt to taste. The carrots should be cut into strips. You need to cut and not RUB on a large grater, to give the sauce a brightness and beauty. Onion and bell pepper also cut into strips. You can cut it into cubes, as you like. Chopped vegetables should fry in a pan with vegetable oil. When the vegetables a little clutch, add tomato paste and continue to fry. Then put zazharku in a pot of meat and potatoes. At this point, need to try the broth, if something is missing, you can add pepper, salt and add spices. After boiling, the fire must be diminish. It is necessary that the potatoes are not seethe. When the potato is cooked, add Bay leaf and chopped parsley. Optionally, you can add pressed garlic. The soup must boil for another 5 minutes, then turn it off. Potato sauce is ready, but it needs to steep, to soak up all the flavors of the spices. Then put it on plates and serve.